Once you've caught you first Pokemon you will learn about the world map and a bunch of other game features as well as how to catch more Pokemon, how to use Poke stops etc... You'll quickly level through the initial concepts and overall the game immediately feels addictive. You'll likely play until you hit level 5 or more and even learn there are new items to be had. Let's break this down though, since already, in two paragraphs, you've been slapped in the face with gamification. As we discussed the first thing you do is catch Pokemon. Catching a Pokemon takes about a minute. During this time you throw some balls at a Pokemon which is oriented in front of you. There is a pseudo 3D effect in play here that feels like you are actually throwing the ball and it feels like the ball is travelling on a real 3D arc in space. The Pokemon will attack, they will break out of your ball, you might miss and you'll notice a little ring that is ever shrinking. All of these effects are in place to try and keep your attention and provide difficulty in the catch. This is part of the flow model where you want to make something challenging enough that a user feels like they have to be engaged but not so hard that they feel like they can't accomplish the task. What about that ring we talked about though, what does that do? Well, it turns out that hitting a Pokemon in the right location can give you a bonus. You get either a Nice, Great or Excellent bonus (with another Curveball bonus that is SO not worth it). These offer you more experience points (10, 50 and 100 respectively for the accuracy bonuses) and you get only get them if you hit the critter in the right spot and the ring is of a small enough size. Capturing with a smaller ring is also related to your capture chance. Once you capture the Pokemon you get experience points, maybe a bonus and some candy/stardust. You start to wonder, what can I do with these new items? Well you can upgrade and "power up" your critters. So every catch, you get something. You get this regardless of how many times you've caught the Pokemon. It was challenging thus involving some aspects of flow while also establishing a very short 1-5 minute feedback loop (which loops back when you catch your next Pokemon). But there is more, you also get NEW Pokemon and you get to add them to your Pokedex the first time you catch them. This experience in the beginning of the game is constant. There are 150 or so Pokemon to catch and you are likely to catch up to 20 in your first session. This drives another feedback loop which is initially the game speed as the catch loop, but gets increasingly longer and longer. Remember this because this feedback loop is the one that drives the craze. Its the "Gotta Catch em All" motto that everyone knows from Pokemon. The game starts with very fast leveling. Only a few hundred to thousands of experience points. This might be only 2-10 catches before you level up again. 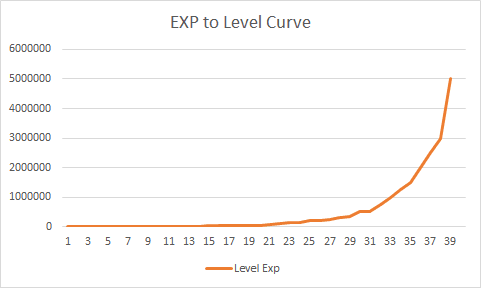 The almost linear curve of growth continues until you reach around level 15. 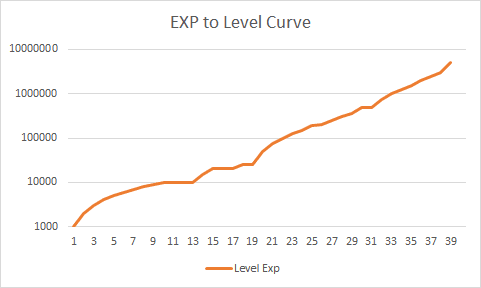 This makes a linear plot look almost silly until you reach level 21 at which point it takes off. The two figures to the right show the curves using both linear and log plots. This means for the first 10 levels you are going to be leveling up like crazy. Leveling up in a game is a huge in the Feedback loop and its something that drives your behavior and how you play the game. For instance, when your leveling is simple and fast you tend to blindly play the game, not optimizing for anything. However, as you get further into the game and levels take longer you start to want the feel of that level again and so you start to optimize and figure out how you can get better at playing. In Pokemon GO this will mean that you learn about how to use your items better, such as lucky eggs, incense and lure modules. It will also mean that you focus more on getting better throws to get throw bonuses. This will increase your flow and your attention towards the game itself. This will all be covered the power leveling section and most of this is covered in my power leveling guide post. In addition to getting some items when you level, every 5 levels you get access to some new items or some IAP (In-App Purchase, aka Pay to Play) based items. For instance, you get your first lucky egg at level 5. This is training you that there is a game mechanic which can speed up your leveling and make it even more fun, but once you use it, you have to pay for more through the IAP. You sometimes get upgraded items, such as a new type of potion that heals your Pokemon faster or a new type of ball, more rare than the normal balls, that allows you to capture Pokemon more easily. These are all small incremental improvements, but once you have access to them, you want more. And the game offers ways for you to get more, by adding these newly unlocked items to your drop rate chance at the Poke stops. Some items, such as a Ultra Ball might have as low as a 5% chance of drop at a Pokestop, so you'd be compelled to visit up to 20 Pokestops to get a chance at just 1 ball!! As you go up in level you get higher CP Pokemon to catch. This mechanic is a blessing and a curse. First, it is a blessing in that even powered up Pokemon you catch in the beginning of the game won't be as strong as some of those you'll catch. But its a curse in that they are so much harder to catch. This scaling level of difficulty is again another form of flow and catching a high level Pokemon that replaces one of your existing Pokemon is quite a moment. I've definitely felt relief, excitement, fiero and more getting one of those catches. I've also felt huge loss when I expend a bunch of rare balls and treats to do it, but that just adds to the feedback loop because it inspires me to go out and keep hunting Pokemon. As a collection game Pokemon GO is great for delivering on achievements and badges. 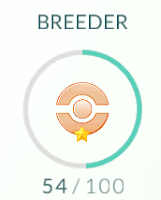 Badges in the game come in the form of collection milestones that give you a one, two or three star badge depending on level. 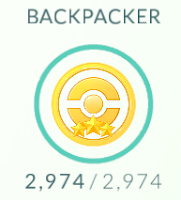 Additionally once you've maxed out a badge it continues to count, meaning that Niantic could improve this mechanic and add even more powerful badges in the future that you would be inspired to get access to. Most of the badges are for collecting certain types of Pokemon and will not be something a user would focus or target. Instead you'd achieve them throughout the games progression. Some badges though inspire you to do something like move around, a lot. There are distance badges with the largest offering a 3 start gold badge for 1,000km or around 600 miles. There are also badges for hitting Poke stops (which refresh every 5 minutes) and so to optimally collect them you must move between them and only return once they have refreshed. I guess you could sit on top of one for hundreds of hours 24/7, but if you want to maximize your time then you have to move. Finally there are badges that drive the competition aspect of the game. You get some badges for improving your own team's gyms or by attacking others. 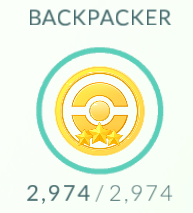 While badges right now don't have a huge impact on the game itself I will point out that the harder to get ones that require the user to continue moving and get in a lot of miles are quite compelling. They've compelled me to maintain an average of around 8 miles per day to try and keep ticking those achievements and I often share those values with others as a note of pride in playing the game. That is exactly the outcome you want from gamification. You want it to provide something into the feedback loop to get people playing and you want players to share it and get others inspired to do the same. In the beginning of the game you are asked to join a team. There are only 3. Red, Blue, Yellow. Valor, Instinct, Mystic. It isn't a big deal. But then you find out what your friends picked and its different from you. This creates a sense of competition within the game among friends, family and strangers. The value in gyms is that you can get some experience for fighting, but it also allows you to consume your stardust and candies to level up your Pokemon. By fighting and improving your Pokemon you start to have a connection directly to them. This is one of the really hard to quantify, sticky aspects of the game. A players affinity for certain characters that they've invested into can be quite a driving force in the feedback loop. But do gyms create a sense of team and do they drive players to keep playing? Yes, this does appear to happen quite often. I consistently overhear stories from people who switched in order to be in the same team as their family members. I suspect at some point there will be an IAP to change your team or even your trainer name since you don't want people to create new accounts and change their login identity to play with their friends. But its amazing that even players as high as into their 20's have quit an account to switch teams to be with the friends. Another great story about gyms and teams was a group I overhead talking about their level 10 gym near their home. Each night they collaborate in order to level up the gym large enough to store 10 of their yellow team Pokemon and rarely does their gym get taken. They take pride in their ability to hold it for days at a time and when it gets attacked they spend the time to build it back up. This is an amazing amount of cooperation, social interaction and a very strong feedback loop to keep playing. After all, if you stop, then its possible your team will lose their gym more often. Gyms offer one last benefit that most people don't know about. You can get Poke Coin which is the IAP currency. You buy Poke Coin and then you buy powerful items with the Poke Coin. This is the only way to avoid paying for the game. So there is a vested interest in owning as many gyms as possible every 21 hour refresh cycle so that you can cash in and get Poke Coin. So far I've not heard of anyone exploiting this mechanic but I think its smart that there is a expert player mechanic in place to provide access to the in-game currency without paying (arguably you can make no more than $1 a day doing this do the mechanics of gyms favoring the aggressor and not the defender). I wanted to pull out the movement aspect of Pokemon GO separately from the rest of the gamification because its probably one of the most powerful mechanics in the game. Distance, in the real world, puts a cap on how fast someone can collect Pokemon, how fast they can level and ties the game to the real world clock and scale. This is hugely important because it makes certain achievements carry a lot of weight. 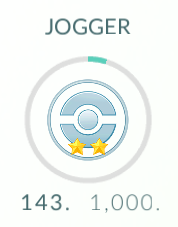 First, we'll start with the distance badges for the Jogger achievement. These guys start at 10km (I think, I got this so fast I forgot to screen cap it ;-) then 100km and finally 1000km. You can view my own data for the 100km achievement which I compared against the distance reported by my iPhone 6s. While the game is not accurate, it still got me out walking 100 miles in the course of 16 days. My average miles per day boosted by 3-4x. When I hit 200km and post the next table you won't even believe how this has scaled up. My second 100km will likely take only 8 or 9 days. 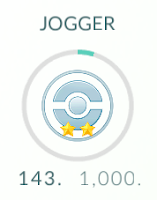 Since these badges are related to a real accomplishment of physical nature which is non-trivial it will be a highly coveted badge to get to 1000km. But why do I need to walk? Can't I just stay in one spot? I could. And for all intents and purposes you could get a lot by staying in one spot. There are 3 and 4 Poke Stop locations that are constantly lured so you can sit and catch all day long. You also get 4 Poke Stops every 5 minutes this way, for 48 Poke Stops in an hour. But what about the 2000 Poke Stop achievement called Backpacker? You'll get it in 42 hours of hanging out. If you did that for 3 hours a day you'd get the achievement in about 14 days. Now, most people won't get the achievement that way nor would they sit at a quad lure spot for 3 hours a day. That's boring. But, you can walk around, get that same achievement in half the hours and have a lot more fun. 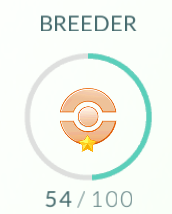 The power in Pokemon GO is how these various achievements are layered though. We have yet another reason to keep moving. It's to hatch eggs which will be the primary way that you fill in your last few Pokemon in your Pokedex. Why? Because some Pokemon are not catchable in your area and you are unlikely to drive/fly to remote regions and spend all day trying to catch a single rare, ultra rare, legendary, etc... By hatching eggs you have a chance at getting those Pokemon much sooner and much more easily than you would by physically catching them. This egg mechanic is badged by the Breeder achievement and it requires that you hatch a LOT of eggs. Tier 1 is only 10 eggs, but tier 2 jumps to 100 and maybe tier 3 is 1000 (hopefully it jumps to 200, I should know soon enough). But this means you've walked a ton of distance. To hatch 100 of the 2km eggs would be 200km, but you can buy additional incubators that would allow you to hatch up to 9 eggs at a time and really accelerate the process. Some of your eggs will be 5km and 10km eggs though and they still count as 1 hatch and you have to hatch them to get more eggs. So at some point you'll be forced to put in some mad distance. Eggs also give you a lot of candy and stardust. Some websites have promoted the idea that end game eggs are the primary mechanic for improving your trainer and Pokemon army. If that is the cast, be prepared to shell out some big dollars since they are the most expensive of all of the IAP ranging from $1.62 to $1.13 depending on how big your IAP purchase is. The are a consumable and only last for 3 hatches as well so you are paying up to $.50 to hatch an egg.